Last Saturday 19 July, ILPH Remus and young Scott Whittington Simpson of Holme Lacy RDA Group, Herefordshire, became national RDA Junior Horse/Pony and Rider 'Walk in the Country 'champions at the RDA Championships at Hartbury College, in Glos. "This is the first time either pony or rider has qualified for the championships," comments Celia Baker from Home Lacy RDA, "and we are absolutely thrilled that they won. Scott did marvelously and Remus didn't put a foot wrong, he is a real christian." 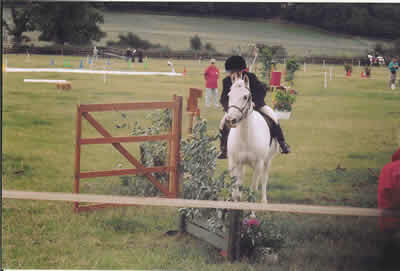 ILPH Remus, a 13 hh 14 year old grey Welsh cross gelding came into ILPH Glenda Spooner in 1996 and after coming back from loan in 2001 went to the Holme Hale RDA group in July that year. Scott started riding Remus once a fortnight last September with a group of youngsters from Blackmarston Special School in Hereford. Scott's instructor Jackie Childs says, "I noticed early on that Scott was a natural horseman and after discussion with his parents arranged for him to come for weekly private lessons. 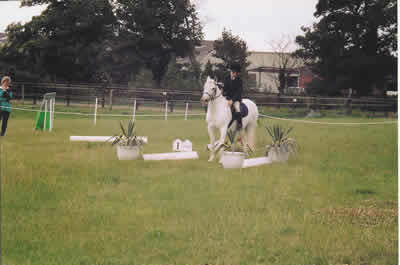 Remus is a very reliable pony, who listened to Scott and took his young rider through all the obstacles in the ring as if he had been doing it all his life. Outside the ring, where there were huge open spaces Remus was a paragon of virtue, and behaved impeccably - he's a real credit to the ILPH."